Harnessing storytelling, technology and design science to form an innovation engine for cross-generational learning and social good. Reboot Stories is a global collective of storytellers, game designers, coders, data scientists, activists, educators and researchers. We produce prototypes that strive to ignite the imaginations of many while turning ideas into action. Our global Learn Do Share (formerly known as diy days) events are a place where inspiration turns into action. Consisting of a series of talks, workshops, prototyping sessions, and a hands-on Experience Hall, Our events transcend “lean-back” conference models. Participants learn, do, and share. Cross-disciplinary innovation draws an eclectic mix of storytellers, hackers, game developers, educators, students, scientists, architects, musicians, and designers from around the globe. Learn Do Share is one of a kind in that it is free and open to all, launching projects that the community can participate in year round. A creative exploration into systemic problem solving using storytelling, technology, design thinking, and collaboration. Learn Do Share Labs are a living think-and-do event that uses storytelling, game mechanics and future scenario design to unleash the imagination of many. It is a think tank meets social hackathon that tackles a wicked problem over the course of three days. A local NGO is often selected as a partner and the Learn Do Share Lab works to provide mindshare, people power and open design to help the NGO tackle a wicked problem they are facing. Learn Do Share Labs run in different cities, each focusing on a category (health, education, economy, government, sustainability, culture, urbanization humanity). The lab is a partnership between FreedomLab Future Studies and Reboot Stories. The results are shared under a Creative Commons license and archived on www.learndoshare.net to be shared, remixed and expanded. Learn Do Share BOOKS is a resource and r&d collection of open collaboration, design fiction and speculative innovation. Scientists, storytellers, designers, hackers, producers, fans, architects, and engineers help create a series of case studies and templates, each of which explains and reflects on collaborative experiments and social prototyping. The results of our open collaboration are rather unusual look-do-and-think-books that explore our methods and lessons learned. The aim is to trigger social innovation by sharing assets for everyone to tap. Learn Do Share BOOKS are closely intertwined with our events - initiated by Ele Jansen as part of her ethnographic research methodology for her PhD at the University of New South Wales in Sydney. Her roadmap is your imagination. Once Lyka has completed her journey around the world, she’ll take all of the children’s creations into a real NASA rocket and shoot up into space. The hope is that when the children look up into the night sky, they’ll be reminded of how far their imaginations can carry them. How do we make the world work for 100% of humanity? Wish for the Future mixes participatory storytelling and design science to envision a better world. Participants make a wish for the future. Wishes are granted through a creative act such as writing a story, making a piece of art, sharing a song, or creating a video. Then granted wishes are prototyped using 3D printers and software hacks in an effort to create a tangible artifact. Afterward, wishes, creative expressions, and prototypes will be placed in multiple time capsules and buried for 100 years. 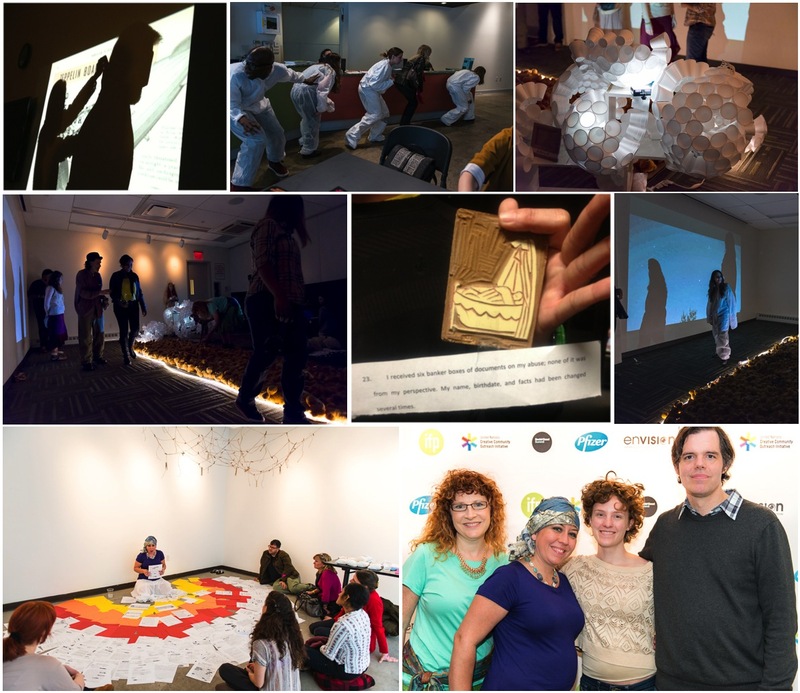 Inspired by the Voyager Golden Records that were sent into space in 1977 and the work of Buckminster Fuller, Wish for the Future is an effort to ignite the imagination of many through experiential learning, creative expression, and collaboration. Wish for the Future is released under a creative commons license and is intended to be shared, remixed and expanded. We're currently developing the project as a board game / mobile app that will interface with the project's site. My Sky Is Falling (MSiF) is an immersive experience that harnesses technology and story to create empathy for the challenges faced by foster youth aging out of the system. Guided by immersive performances and sensor technologies, participants uncover a dystopian sci-fi tale. The ending reveals MSiF’s roots in real experiences of foster care when participants have an open dialogue with the foster youth behind the production. This Reboot Stories purposeful storytelling open design was developed with Columbia University, foster care NGO Orange Duffle Bag Initiative, and Lydia Joyner, a writer/director who grew up in foster care. In partnership data research center The Harmony Institute and Affectiva, a biosensor company out of MIT’s New Media Lab, we continue to innovate new ways to collect data and measure the social impact of MSiF’s immersive experience. MSiF and this data are the basis of our whitepaper, which will help inform industry shifts towards depth of engagement, empathy, action-oriented investment, purposeful storytelling, digital literacy, and social change. This data also informs iterations of MSiF, which will be released as a creative commons framework for foster youth to produce with foster care groups like the Brevard Family Partnership and ASPIRAnet to use in training sessions for potential foster parents and social workers. The intention is to help participants understand on an emotional level what it is like to be a foster child. Are you interested in storytelling, play, design, and social good? Reboot Stories is part of a global community of thinkers & doers. If you like to collaborate with us we'd love to hear from you. We're on facebook & twitter.